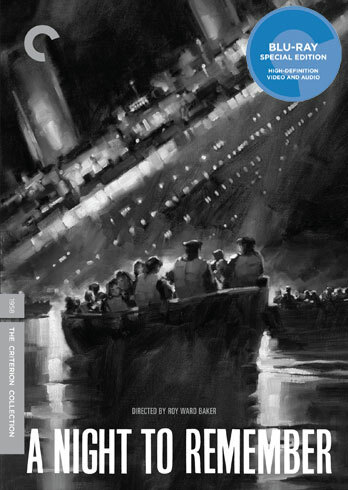 Just ahead of the 100th Anniversary of the Titanic disaster, Criterion is reaching back all the way to one of its first DVDs — spine #7 — to upgrade A Night to Remember, Roy Ward Baker's excellent dramatization of the tragic events of April 14, 1912. Of course, that Baker's film is so successful is largely due to the absence of dramatization — subplots are kept to a minimum and there's only a nominal protagonist in Kenneth More's stoic Second Officer Charles Lightoller. The film is understated and respectful, but hardly pedestrian. After moving quickly through the country's sense of wonder surrounding the unsinkable behemoth and brisk introductions to a number of the ship's passengers, the film plunges right into disaster, with the ship's hull breached by an iceberg while the first act is still underway. Sourced from the nonfiction account by Walter Lord, the film portrays a series of miscommunications and missed communications both leading up to the catastrophe and in its immediate aftermath that undercut enormous technological hubris. As the ship begins to dip beneath the frigid water, Baker's camera travels all across it, giving us glimpses at the rigid class divisions between passengers and the final human moments of a variety of men and women. Despite the fact that nearly every character is just a brief sketch, Baker imbues each with a sense of tangible humanity, from the father deceptively coaxing his wife and children onto a lifeboat to save them without alarming them to the ship's musicians, holding fast to their duty to the very end. There's even a grim sense of beauty in the film's shots of inanimate objects — a food cart slowly rolling across an empty dining room as the ship tilts, racks of freshly baked bread falling in unison. A Night to Remember captures both the enormity and the intimacy of the tragedy in steady docudrama form. There's no need to juice the story with romantic entanglements or against-all-odds heroics. The small moments in the midst of a massive disaster are far more compelling. Presented in 1080p high definition in its original 1.66:1 aspect ratio, A Night to Remember has been given a substantial upgrade here. The black-and-white image is gorgeous throughout — exceptionally clean aside from a few stray scratches, richly detailed and film-like, and featuring perfect grayscale reproduction. Blacks are deep, whites are bright and both remain stable throughout the film, aside from a few dips in quality during insertions of stock footage. The uncompressed monaural audio is also quite clean, with perfectly intelligible dialogue and solid effects. The extras also get a nice boost up from the old DVD. Carried over from that release are an audio commentary by historians Don Lynch and Ken Marschall and an hour-long 1993 making-of featuring producer William MacQuitty's behind-the-scenes footage. New to this edition are an archival interview with survivor Eva Hart, a 1962 Swedish documentary featuring additional survivor interviews and a 2006 BBC documentary on the science behind the iceberg itself. The disc also includes the film's theatrical trailer and the package includes a booklet with an essay by critic Michael Sragow. The upgrade here is considerable across the board, and the film itself is an easily preferable alternative to that Titanic 3-D re-release.